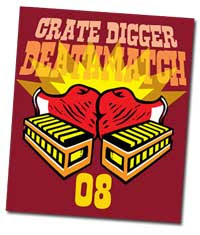 That's the challenge of the Crate Digger Death Match. Actually, you can record the thing on gold-plated 2" tape, but the sound sources can't cost more than $12. Thats your Casio VL-Tone out, then. Guess that means I can only use Garage Band (came free with OS X) and my Juno-106 which I got as a gift when I was 14? Beatboxing and box-beating it is, then. The $12 limit is only on sound sources, anything editing software, equipment, or technique can be used. The kids at dublab.com did something similar and are making a movie about it. $5 dollars from this chain of thirft stores and make a recording to then put back into their system... perhaps a bit confusing but check out the trailer. I go for the free bin at a local store. I usually walk away with a handfull. The rules are daunting... not sure why anyone would submit to them. Example - 8AM to 8PM Eastern Standard time... that's 5AM for us ol' West coasters - my local thrift stores don't open til 9AM AKA 12:00 EST. Opening the door to any software manipulation renders the source sound somewhat irrelevant. Run any crappy square wave oscillator source into Reaktor, and you can get a synth that rivals most of my hardware. I think the 1-day bender contest was better executed and thought through. the 12 entry places are now full. Alfred, thanks for the link, that project looks cool and I haven't heard of it before. Gerald, I don't think the rules to be that daunting. I live on the west coast too, but I don't have to start until I want to really. I could get up at 5am, but I'll probably wait till 10am to go shopping and such. Being that it's a 12 hour long production, I probably would start any later that 5pm anyways, so that's not really a problem either. In regard to editing, what we want to see is a variety of production styles, that's why the rules are written the way they are. I'd love to see someone enter using synth sounds that they created and hear how that sounds compared to someone who literally just mashed up songs together with minimal editing. kind of stupid considering a computer is hundreds of dollars, not counting software. No you can't. Read the rules. You have to use items bought for less than $12 at thrify shops on the day of the recording and need to make a copy of the till receipt to prove this. The albums have all been completed and the online voting has started. 12 men entered, 7 remain. The 7 singles online are great, I think you can really hear the producers having a good time. The music sounds like average techno/trip hop, but with bad samples. I knew it would all be lots of little loops, with no tempo changes. The kind of music where you can see the arrange page scroll by as you listen. No recognisable human performances at all. At least none longer than a bar. Oh well. It's kinda nice anyway. Just wish I could be surprised once in a while.